Warren William odds and ends including Warner Archive release of the Bobby Jones Golf Shorts and Perry Mason Collection; Wild Bill Hickok Rides on TCM, Nov. 27; PLus my latest Warren William collectible acquisitions. A look back at how Warren William has grown in popularity the past 5 years leading into TCM’s Summer Under the Stars tribute on August 30. Warren William as J. Lawrence Bradford in the Warner Brothers hit musical Gold Diggers of 1933. Includes notes on the publicity campaign. 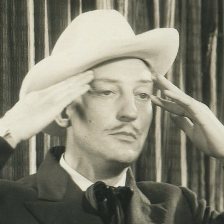 Warren William stars as Chandra in The Mind Reader (1933). A look at the growing cult of William. Where it stood by the time of this title in 1933 and why this character helps bolster his pre-code reputation today. A look at MGM’s Arsene Lupin Returns (1938) starring Melvyn Douglas as Lupin and Virginia Bruce as his girl. With Warren William sleuthing.